Accent Lighting was founded in 1979 and has become the largest lighting showroom in south central Kansas. Accent Lighting provides quality lighting for residential homes, restaurants, hotels, and commercial buildings all across the United States. We have a staff of lighting experts with combined experience of over 175 years. No matter what your lighting needs are, Accent Lighting can provide expert layout and design service. Accent Lighting is much more than just lighting fixtures. We also carry extensive brands of home accessories, accent furniture, prints, and mirrors. All shown in our easy to shop 6,700 square foot showroom. Call or come by and let Accent Lighting help you solve all your lighting needs. 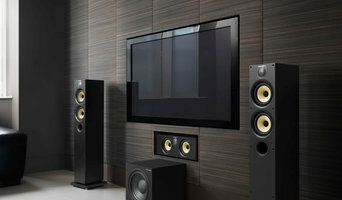 As Wichita's sound and home theater experts, we are passionate about music and custom home automation. At LivingSound our goal is to make your home and lifestyle work beautifully together, and our design team is here to help craft the perfect solution to fit your needs. Call or visit us today to schedule your complimentary site survey. Owner Gary Jones and Operations Manager Thomas Shafer invite you to visit, listen and explore. Gary, Thomas and Team LivingSound all love good music, and are passonate about bringing the best in sound and home automation to Wichita. Stop by for a cup of coffee and let's talk about your favorite song, group, or concert. What services do Wichita outdoor audio and visual system professionals provide? For the most part, people hire outdoor entertainment system providers for backyard installations. After all, pool parties and barbecues are much more fun when there is music to enjoy. How do they do it? Your Kansas outdoor custom audio system technician can work with your landscape designer or architect to install weather-resistant outdoor speakers, discreetly buried into your landscaping with no loss of sound. Here are some related professionals and vendors to complement the work of outdoor lighting & audio/visual systems: Landscape Architects & Landscape Designers, Landscape Contractors, Decks, Patios & Outdoor Enclosures, Siding & Exteriors. Home theaters are moving outdoors, too. Sports fans can grill without missing the game, and families can invite neighborhood friends over for movie nights. Special weatherized flat-screen TVs are coated to minimize glare. Imagine your Wichita, KS backyard with a custom-designed outdoor theater system — complete with a large projection screen. It makes backyard entertaining easy. Find outdoor audio and visual system professionals on Houzz. Look in Houzz’s Professionals section to find Wichita, KS outdoor audio and visual system experts. Narrow your search to the nearest city or metro area for a list of nearby businesses. Get contact information, read reviews and look at completed Kansas custom outdoor sound system projects.